Enjoy your favorite cash game in our World Famous Poker Room, where it all started. Binion's Gambling Hall offers $2/4 to $10/20 Limit Hold'em, $1/2 to $2/5 blinds No-Limit Hold'em, and $4/8 Omaha 8 or better on a regular basis. If you would like to play a different game or limit, just ask one of our friendly team members to start a list for you. We will spread any game or limit we get an interest in. Binion's take no money from pots for promotions, and only a 5% rake. Max of $4 on $4/$8 and higher Limit games and all No-Limit Games. Earn $2 per hour in comp dollars with no daily max! Enjoy your style of play on any of our Blackjack games, featuring single decks and shoes alike. Join in the fun in our Party Pit where music and prizes add twist to Casino Gaming. Play craps on the most historic craps game on Fremont Street. 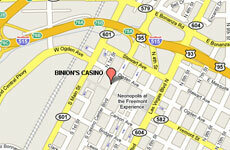 Binion's offer 5X's odds and excitement in abundance. We offer American Roulette for the high roller and recreational player, as well. Bet the numbers straight up or any combination of lucky numbers. Binion's offers a wide selection of interesting and exciting games to include Pai Gow, and Mini-Baccarat for exiting, fast-paced action! 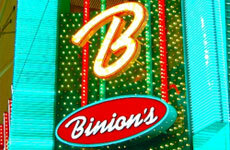 From your classic favorites to the latest in reel and video slots, Binion's has the action you're looking for!